And who made your beer? In the spirit of it being almost Friday, and while we’re on the topic of your favorite beverages – perhaps wine puts you to sleep, couldn’t care less where it came from, but prefer the bitterness of lager beers at your tailgate party? While ales are primarily fermented with the same yeast species as wines, Sacchromyces cerevisiae, alloploid hybrid strains of Sacchromyces eubayanus with S. cerevisiae – S. carlsbergensis (Saaz), and S. pastorianus (Frohberg) are used extensively in brewing lagers, the origins of which are yet contentious. Baker et al. (2015) sought out to solve this mystery with a high-quality de novo assembly of the S. eubayanus genome with the Yeast Genome Assembly Pipeline. Analysis of maltose (MAL) utilization genes revealed 14 genes across 4 chromosomes, and 2 pseudogenes. Comparison with several other MAL genes across Sacchromyces (eg. MAL genes in ale counterparts) showed large levels of sequence identity (98%), with phylogenies indicating common origin of all MAL genes across brewing yeasts. Genome-wide signatures of domestication were quantified using dN/dS computations along each lineage, showing significantly (P < 1e-21) greater proportions of nonsynonymous substitutions in the Saaz and Frohberg lineages, while the two lineages themselves did not differ from each other, suggesting little/relaxed purifying selection and/or population bottlenecks, compared to non-lager lineages. Similar higher proportions of nonsynonymous substitutions were also observed among metabolic genes such as NOT3, ADR1, and ADH2. Testing levels of neutral divergence (equal levels implying single origins of Saaz and Frohberg from a single nucleus hybrid of S. cerevisiae and S. eubayanus, compared to different levels due to multiple origins) indicated support for the multiple origin theory, with dS (rate of synonymous substitutions) being over ten times higher in S. cerevisiae subgenome of lager strains, than in the S. eubayanus subgenome. 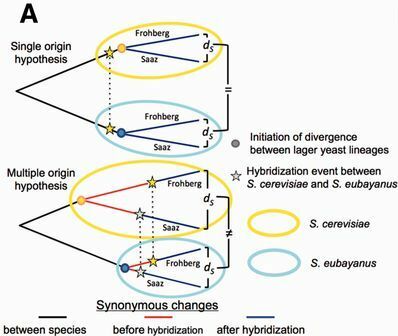 In this context, these results suggest that the Saaz and Frohberg lineages were created by at least two distinct hybridization events between nearly identical strains of S. eubayanus with relatively more diverse ale strains of S. cerevisiae. This entry was posted in adaptation, evolution, genomics, natural history, next generation sequencing, phylogenetics, population genetics, selection, speciation, yeast and tagged genomics, natural selection, NGS, population genetics, yeast. Bookmark the permalink.